I read – and loved – The Thirteenth Tale earlier this year, and went to the library to pick up Setterfield’s second novel straight away. I did put off reading it for a while as I think I was nervous it wouldn’t live up to her first – and ultimately this was the case in the main! This really is a novel of two halves. At the start we are introduced to William Bellfield who, when playing with friends aged ten, inadvertently kills a crow. We then follow him in the coming years as he grows up and starts to work in his family’s cloth mill. He thrives in this environment and business is booming – until tragedy strikes. I really enjoyed this first half of the novel. The historical setting worked well and I liked the character of William. I didn’t even mind reading about the workings of the mill. But then around halfway through the book, William’s life starts to fall apart and, following a creepy encounter, he starts up a new business. This is when the book started to go downhill for me somewhat. Not enough really happened in this section and I found the book dragged as we got bogged down in too much detail about William’s new business venture. The creepy element of the book never really came together and I found myself skimming sections. Although this book was well written, and there was a lot I liked about it, I was definitely disappointed overall. The second half of the novel didn’t quite work for me and more needed to be made of the ghostly element of the novel. The Thirteenth Tale is one of my favourite novels as well. 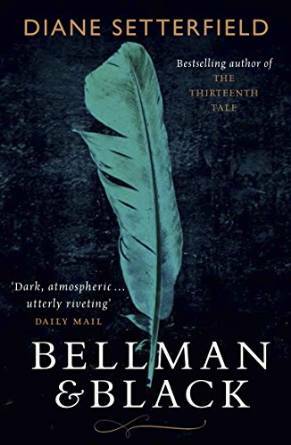 I liked Bellman & Black, but didn’t really enjoy reading it. I guess my expectation was too high. It must be almost impossible for an author to live up to the standards set by The Thirteenth Tale! Very much how I felt about this one too. The whole supernatural thing never really goes anywhere, and while I did find a lot of the stuff about the emporium interesting, I felt there was basically no plot, just a lot of research being thrown at the reader. Pity!